At Columbus Center for Medical Rehabilitation we provide a comprehensive outpatient program designed to assess and treat patients who suffer from imbalance, unsteadiness, poor coordination, gait disturbances, dizziness/vertigo, and visual motor difficulties. 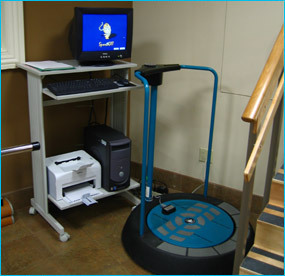 This program uses a customized approach to prescribing exercises to remediate symptoms and deficits as well as a computerized balance feedback machine (KAT 3000). The goal is to return the individual to a maximum level of functioning at home, at the workplace, and community despite illness and disability.